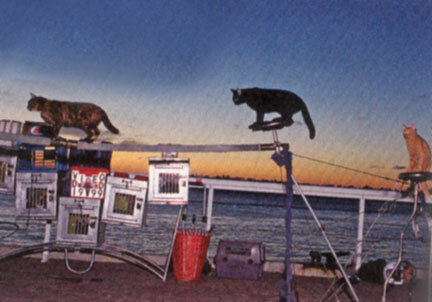 Excerpt from "The Cats of Key West"
At sunset, conchs and tourists gather in Mallory Square to applaud the sun for its good work during the day. Dominique LeFort and his cats get almost as much applause. leFort, known as the Catman, began his hilarious lion tamer act with house cats during the Reagan administration. Cackling in nonsensical Franglais, the Catrnan puts his cats through their paces. They dance, they run obstacle courses and leap through hoops of fire. All of leFort's cats - Oscar, Cosette, George, Mandarin, Chopin and Moon - are rescued strays. They don't need handouts like most of Key West's feline citizens; they're gainfully employed. At home, leFort spends a lot of time on the floor with his cats. The act goes better, he told the "Boston Globe,' when the cats think he's one of them.